A hair clog, grease build-up, or uncanny food waste thrown down the garbage dispenser undoubtedly clog your drains and pipes. But chemical drain unclogging solutions are quite expensive, and so is calling the plumber. Fortunately, we rounded up 10 powerful homemade drain cleaner recipes that will successfully remove any clogs. 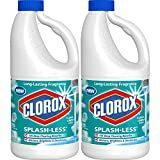 Each of these recipes is very cheap to put together and helps you get rid of the toxic chemicals in commercial cleaning products. 1/4 cup of baking soda. 1/4 cup of cream of tartar (potassium bitartrate). Take out the drain trap and use a paper or cloth towel to wipe away any visible remnants around the drain. 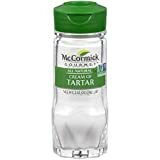 Then, mix the cream of tartar, baking soda, and salt and add a bit of water to make the composition creamy. Pour the homemade drain cleaner down the pipes, let it act alone for about 20 minutes, then pour the boiling water down the drain as well. 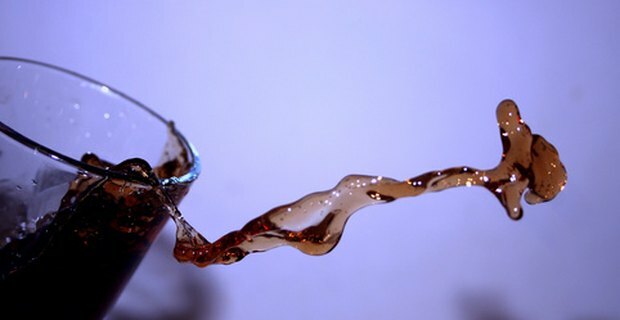 Let the mixture sit for about one hour; if you hear some sizzle and fizz, take it as a good sign – that’s the ingredients dissolving any junk deposits lining the drain and the pipes. After an hour, rinse with warm water. If the drain clog is caused by a grease deposit and the homemade drain de-clogger hasn’t worked thoroughly the first time, cold water may make things worse. If the water still isn’t flowing as it should, repeat the procedure and let the homemade clogged drain cleaner sit overnight. Baking soda (base) is an effective remedy for clogged drains when combined with vinegar (acid), too. Vinegar cancels nasty odors caused by junk buildup, while baking soda acts as a powerful disinfectant and anti-bacterial substance. When combined, the 2 substances exchange molecules and create water and carbon monoxide. These final products break up and displace the clog in a fizzy reaction and can even dissolve hair and other clogs. 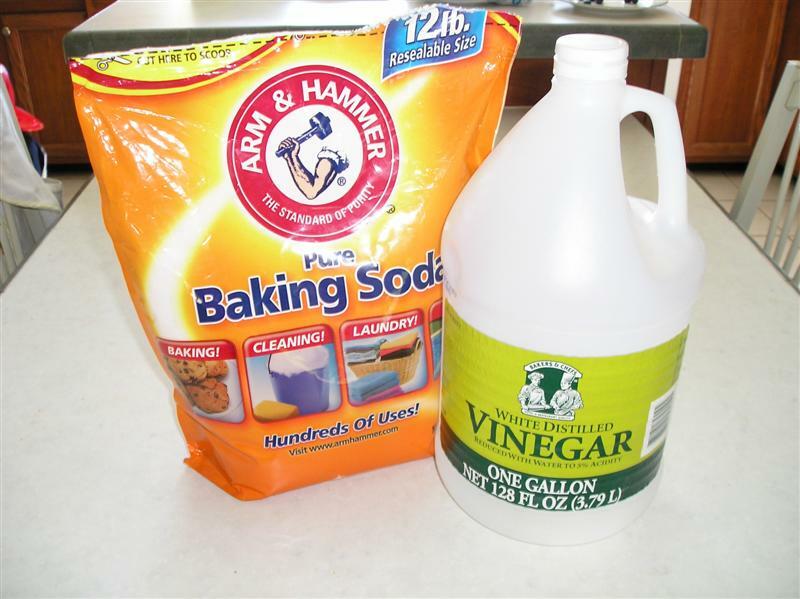 The days when you had to call a plumber to do the dirty job are gone thanks to this homemade drain cleaner recipe with vinegar and baking soda. 3/4 cup of baking soda. 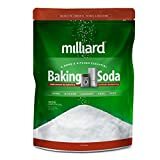 Pour the baking soda down the drain and let it settle, then pour the vinegar and cover the drain with a plug, a towel, or a plate to make sure the reaction is contained inside. Let the magic homemade drain cleaner work for about 30 minutes, then remove the plug or drain cover and use hot water to rinse it off. If your drain is seriously clogged, you may need to repeat the procedure again. This homemade drain cleaner recipe is one step up from the previous one due to citrus peels and the citrus peels-infused vinegar, which works even better to unclog pipes. Not only does it smell divine, it’s also a natural alternative to all the fragrance (yet toxically fuming) commercial cleaners. Citrus peels (as many as you can get from the oranges, lemons, and grapefruits you’re eating). 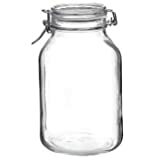 Mason jar with airtight lid. Stuff the citrus peels inside and pour vinegar almost to the top, then cover with an airtight lid and let it sit for about two weeks. To use this remedy, pour the baking soda down the drain and the citrus peel infused vinegar immediately after. Cover the drain with the drain plug to keep the fizzy foam contained. After 30 minutes, pour hot (even boiling) water down the drain. If you’re looking forward to using this homemade sink drain cleaner on the garbage disposal drain, here’s a pro tip: use the citrus peels as well. Run the peels through the disposal to release the essential oils still left in the peels so that you will get rid of all the nasty smells that may have accumulated in time. 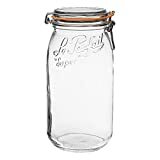 This package contains one Le Parfait glass preserving jar. This product has the discontinued galvanized wire. Please enjoy our new products launched in 2019 with STAINLESS STEEL wire! Using baking soda for the drains and pipes in your home is already known as a miracle worker, but the benefits of using lemon juice are less known. However, one cup of lemon juice will work better than vinegar when it comes to unclogging the pipes and drains as it’s more acidic than vinegar. It may be slightly more expensive, but the after-smell is better and the cleaning properties of this homemade drain cleaner are enhanced. 1 cup of lemon juice. Use baking soda and lemon juice like you would use baking soda and vinegar. Pour the baking soda and the lemon juice down the drain and cover it for about 30 minutes. Then, rinse with hot water for about 2 minutes. Salt is a mild corrosive and anti-bacterial ingredient which can efficiently clean the drain and vinegar is an acid that breaks clogs apart. 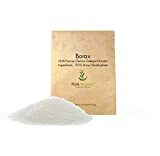 Borax has been a household staple used for its cleaning properties for ages. There are two ways to use these elements for drain cleaning. 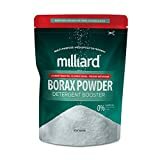 To use the dry and wet ingredients separately, pour the salt and borax into the drain, add the vinegar and cover for 30 minutes, then rinse with hot water. You can also mix the dry ingredients together in a large bowl, then add vinegar and slowly mix the ingredients to prevent the fizzy reaction from over-spilling the mixture. Once the fizzy reaction is somewhat settled, pour the mixture down the drain and let it sit for 30 minutes. Rinse with hot water. HIGHEST QUALITY POWDERED SODIUM BORATE WITH NO ADDITIVES OR PRESERVATIVES. SAFE: NO HARSH CHEMICALS OR HEAVY SMELLS. NON-IRRITATING ON SKIN. 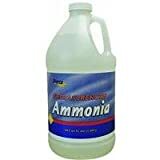 Ammonia is another potent cleaning compound and a proven homemade drain cleaner. 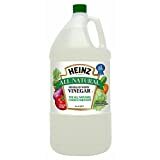 If you can get over the pungent smell, ammonia is one of the best homemade drain cleaners available. Mix ammonia into boiling water, pour it down the drain, and let it sit for about half an hour. You can also use a plunger to loosen any clogs that may still be lining the pipes. After 15-30 minutes, pour a kettle of boiling water to rinse off everything. This homemade drain cleaner won’t just smell fresh and clean, but it will effectively remove all the stains, hard water spots and surface dirt lining the drains, bathtubs, toilets, showers, or sinks. 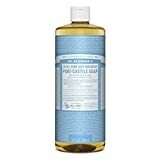 As it lacks the acid component typically in the form of vinegar, it may not work as efficiently to remove clogs or large fat deposits, but this soft scrub and cleaner will work wonders for sinks and tubs that take longer to drain. 1/4 cup of liquid Castile soap. 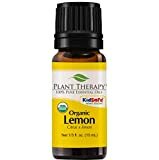 10 drops of lemon essential oil, a strong antibacterial punch to the mix. Mix the ingredients in a bowl, pour the mix into the drain, wait 30 minutes, then rinse with hot water. Lemon and other essential oils are also ideal to treat bed bugs – check out our complete list of home remedies for bed bugs here! And if you’re looking for some more natural solutions for common problems you might have in your bathroom, we also recommend reading our collection of home remedies for black mold! 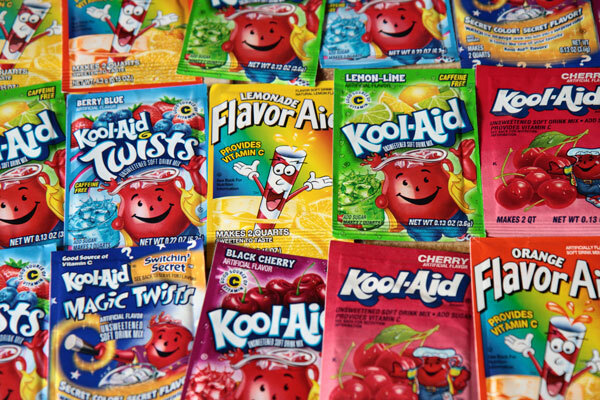 Kool-Aid can work as a homemade drain cleaner against hard water and calcareous deposits on the pipes and drains thanks to its high citric acid content. For a more thorough clean, you can also add some baking soda. 1/4 cup of baking soda (optional). Pour the powders down the drain and let them work for half an hour, then wash them down with hot water. Bleach is one of the most toxic substances you can use as a homemade drain cleaner. However, when a drain is severely clogged, bleach may be your only hope. Pour bleach down the drain and let it sit for one hour, then use hot water to rinse it off and push down all the clogs. 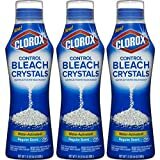 If the clog is very compact, go for liquid bleach, but if the clog allows some water to drain through, go for bleach crystals instead. We are aware of the myth busters’ kind of imprint on this homemade cleaner for drains. Nonetheless, given its acidic nature, it’s an effective cleaner for kitchen and bathroom drains. It can dissolve calcareous deposits, greasy buildup and much more. Large bottle of soda at room temperature. Pour the liquid down the drain and let the phosphoric acid work its magic. After 15-30 minutes, let hot water run for about 5 minutes. When trouble kicks in, use any of these powerful drain cleaners to fix any clogged drains with a homemade, natural drain cleaner. The only thing you should mind is that any homemade drain cleaner should be used routinely. Before you risk a clog disaster, use these homemade drain cleaner recipes and remove grease build up, hair clogs, and food debris in no time. Thank you for leaving your feedback. As we are looking into home remedies and found plenty of options we consider effective, we haven’t requested quotes from heating companies.